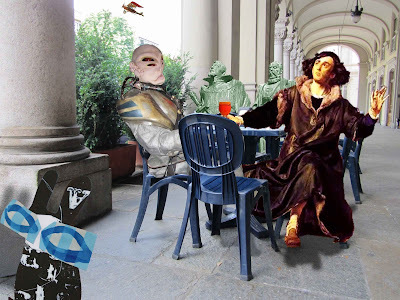 Wabsworth, the Wabbit’s android double, was merely hopping through the porticos to pass the time of day when he heard two things. One was the drone of Susan the Biplane bringing the Wabbit home from space. The other was a strange conversation in which the Wabbit was mentioned. Wabsworth shuffled behind a pillar and listened carefully. "I seek a John Kepler," said the Alien Pliot. "Commander Wabbit says he is interested in buying my asteroid." "You’re not a local," said Copernicus, "so just how did you get here?" "One second I was in slipstream drive," said the Pilot, "and the next I was sitting here with you." There was an awkward silence. "I want my money," said the Pilot. "Well you won't get it from Kepler," said Copernicus, "he’s always completely broke." "That Wabbit!" shouted the Pilot. "I never trust them myself," said Copernicus. "Can I interest you in a drink?" "My only interest is is financial," said the Pilot. "I can’t help you there," said Copernicus, "but might I enquire exactly what is an asteroid?" "Usually, it’s a body that orbits elliptically around a planet." "Heavens," said Copernicus and lifted his drink. "I know all about that, so here’s to revolutions!" He drained his drink and called for another. "That Wabbit is here," muttered the Pilot, "I can feel it in my conduits." Copernicus shook his head, then pointed. "I’m unfamiliar with Turin, but look! Isn’t that a wabbit over there?" But Wabsworth had gone.